I met Landscape by Beth Lipman (American, 1971) and Ingalena Klenell (Swedish, 1949) three years ago as a graduate student at University of Washington’s Museology program. We came to Museum of Glass for one of my class field trips, and Landscape definitely made an impression. If you haven’t had a chance to see the piece, it is truly breath-taking. 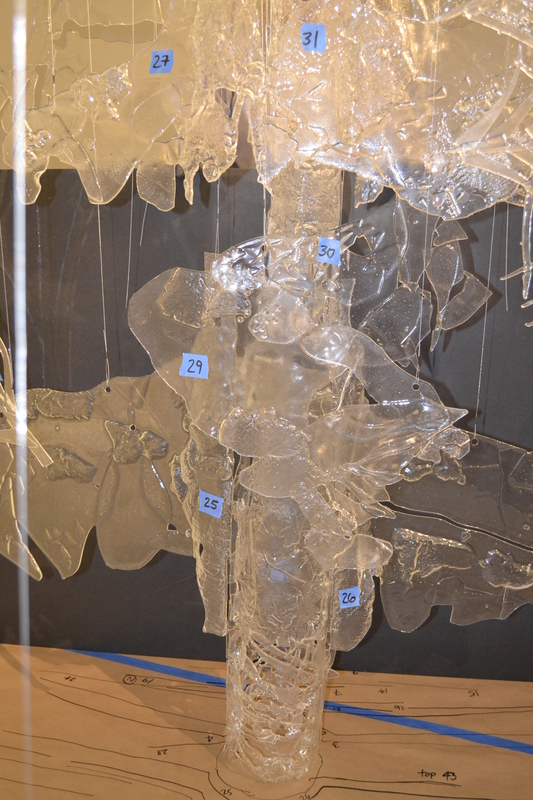 It is a 3D, 31×18 foot collage made of 425 thin pieces of glass that hang from the ceiling or sit on the ground to compose a wintery landscape. 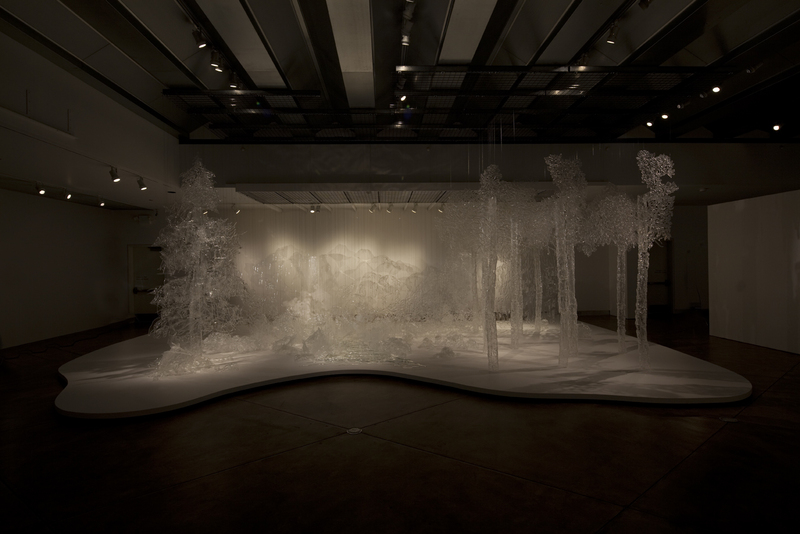 Landscape, installed at Museum of Glass as a part of the exhibition Glimmering Gone – Ingalena Klenell and Beth Lipman which was on display August 21, 2010 – March 11, 2012. As I sat on a bench looking at the piece, I turned to one of my classmates and said “Man, I feel sorry for the guys who have to take that down.” Turns out…one of those guys is me. Last week I traveled with our exhibition designer, Lynette Martin, to Figge Art Museum in Davenport, Iowa, where the Landscape had been on loan since February 2014. Our mission? 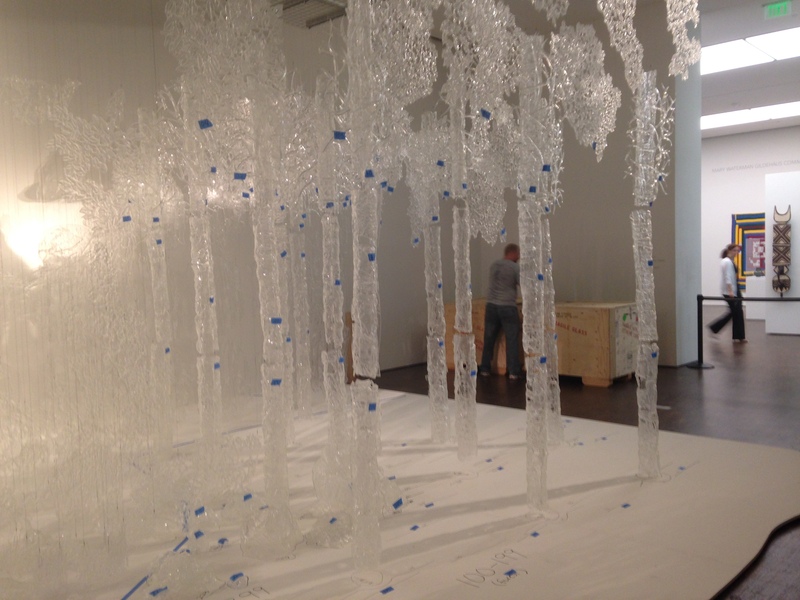 To successfully take the piece down and pack it in crates, all while documenting the location of each piece so that we can hang Landscape the same way at future venues. Imagine you just completed a 500 piece puzzle. And, now that you’re finished, you have to write instruction as you put it away, so that the next person can put it back together exactly the same way. That is a good way to think about our process. Here’s how we did it: 1. Number each of the pieces using pieces of blue tape and Sharpie. The forest, complete with blue tape numbers. 2. Take lots of photographs! We use these photographs to help decipher where each piece of glass goes, along with how to orient it top to bottom. Since all of the pieces are clear, we use a black piece of tagboard to create some contrast between layers. We used black tag board to make the individual pieces of the fir tree more visible. 3. Trace the outline of each piece directly onto the floor using a Sharpie. The result was a huge, numbered, template that described which piece goes where and corresponds to the photographs and numbers. We took a large sheet of plastic and traced over the floor, giving us a map that we can use for the next installation. The base of the fir tree, with rocks numbered and traced on the deck. Those three steps got us through all 425 pieces of glass. It took a team of 6 people about 140 hours to take the piece apart, all while surviving near-record temperatures and humidity, along with a close encounter with a tornado. We couldn’t have done it without Andrew, Robin, Steve and Justin – the fabulous crew at Figge Art Museum. Now that it’s all said and done, we’ll organize our notes and be ready to assemble the piece at the next exhibition venue. Until next time Landscape! 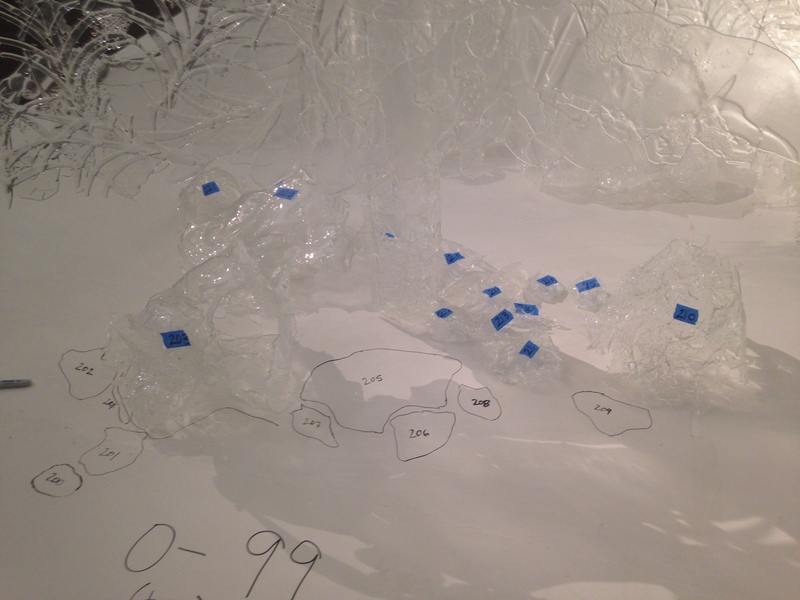 This entry was posted in Art, Exhibitions, Glass, Museums, Uncategorized and tagged 3D, art, Beth Lipman, Figge Art Museum, glass, Glimmering Gone, Ingalena Klenell, Landscape, MoG, Museum of Glass on June 26, 2014 by Museum of Glass. 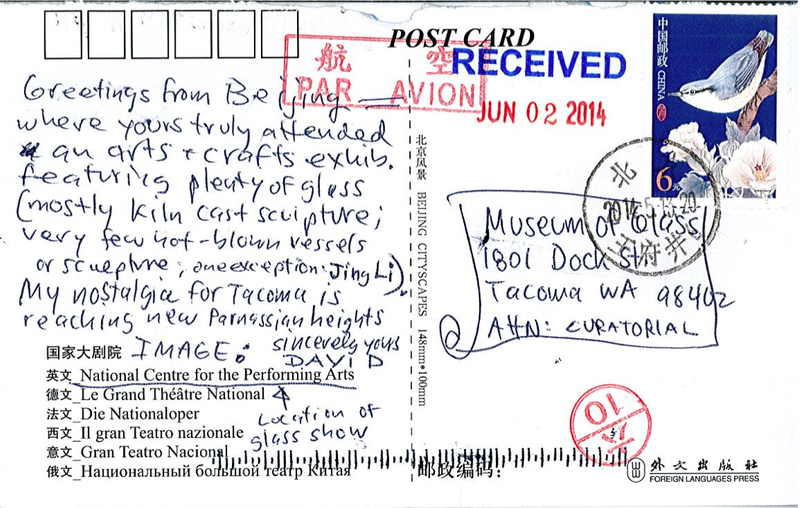 Museum of Glass curator David Francis, who took a five month leave of absence to join his family in China, has sent us an update on how his stay in Beijing is going. It appears he’s getting a bit homesick. 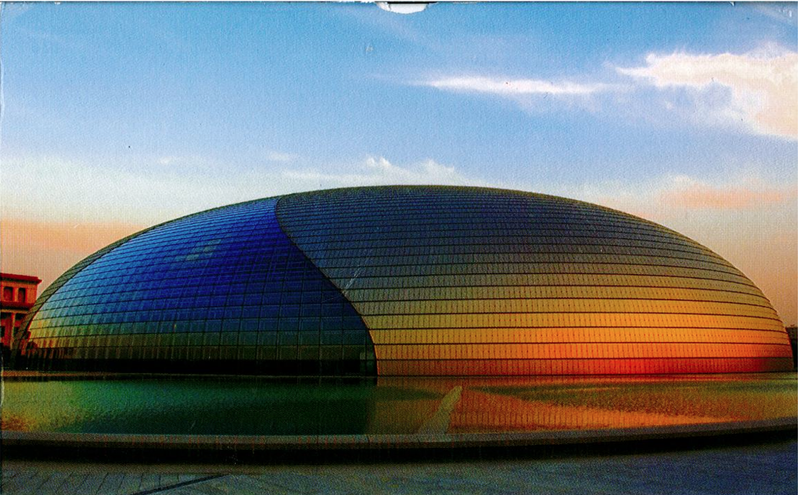 This entry was posted in Art, Artists, Events, Exhibitions, Glass, Museums, Uncategorized and tagged Arts, Beijing, Cast, China, Crafts, David Francis, Exhibit, Hot-Blown, Jing Li, Kiln, MoG, Museum of Glass, National Centre for the Performing Arts, Sculpture, Vessels on June 3, 2014 by Museum of Glass.